A post-Christmas drive took us down to San Diego, to visit the Museum of Contemporary Art for an exhibition in the Pacific Standard Time series, Phenomenal: California Light, Space, Surface installed at both the downtown gallery and the original MCASD space in La Jolla. A big enthusiast for this great period in the history of California art, I had been planning to get down there for some time, but had been postponing the trip for a variety of reasons. It proved worth the drive. Before heading for the museums, though, we made a stop at Ellie’s sister, Susie’s house in the heart of San Diego, just to deliver our holiday greetings in person and wish her well for the coming year. Susie is an ardent and knowledgeable fan of “mid-century” architecture and interior design, and has a great eye for quality when it comes aesthetic choices. Her present abode is filled with delightful objects—art works, pottery, textiles…—that make it a real pleasure to visit. It’s a hobby, a lifestyle, a passion that obviously brings joy into her life and helps her to create an environment that manages to be at once spare and rich in meticulously chosen detail. Good for her, in a world where so much is hasty and utilitarian, to devote herself to simple elegance and beauty. As I've said, I’m a sucker when it comes to California Light/Space art. I arrived in California in 1968, when the movement was still at its height. (I tend to see it as a logical historical development both from the impressionistic “plein air” tradition of the early years of the 20th century; and of the hard edge color abstraction of the forties and fifties.) At the time, I had little exposure to the work of contemporary artists, and this work intrigued me particularly because it had avowedly to do with the phenomenology of perception—how the mind/eye perceives the world about it, how this phenomenon itself can be brought into service as a medium for the artist, and how our perception can in turn be changed and enriched by the artist’s vision. I came to California as a poet; this art did not ask me to bring my intellectual, verbal self to “understand” it; it offered itself instead to my openness to the experience of the moment. 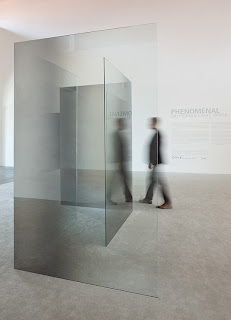 Larry Bell, untitled, ca. 1970, Inconel coated glass in 5 panels. Courtesy of the artist and the Hendrickson Family Collection. © Larry Bell. Photo by Philipp Scholz Rittermann. 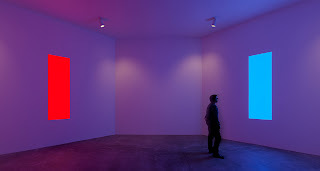 Doug Wheeler, DW 68 VEN MCASD 11, 1968/2011, white UV neon light. Courtesy of the artist. Photo: Philipp Scholz Rittermann. James Turrell, Stuck Red and Stuck Blue, 1970, construction materials and fluorescent lights. Collection Museum of Contemporary Art San Diego, Museum Purchase, Elizabeth W. Russell Foundation Funds. 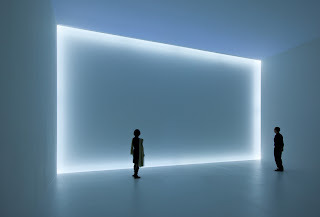 © James Turrell. Photo by Philipp Scholz Rittermann. ... seemed a bit jaded, no longer quite so exciting to the senses as it once had been. (Actually, they look pretty brilliant in these images!) But I did find that excitement in an unrelated gallery, the one devoted to a huge installation by Jennifer Steinkamp, a digitally- generated heir to Light and Space, where layered, constantly moving images of flowers and blossoming trees evoked the random, ceaseless motion of the subatomic world writ large, expanded to the scale of three aircraft-hanger sized walls, as visually intriguing as they were awe-inspiring in their beauty and their shifting patterns of relationship. Helen Pashgian, Installation view of three untitled works, 1968-69, Courtesy of the Museum of Contemporary Art San Diego, Museum purchase, International and Contemporary Collectors Funds; Pomona College Museum of Art, Claremont, California; Norton Simon Museum, Pasadena California, Gift of the artist. Photo by Pablo Mason. 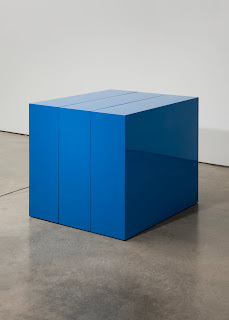 John McCracken, Blue Block in Three Parts, 1966. Lacquer, polyester resin, fiberglass, plywood. Collection Museum of Contemporary Art San Diego, Museum purchase with funds from Ansley I. Graham Trust, Los Angeles. (c) The Estate of John McCracken. 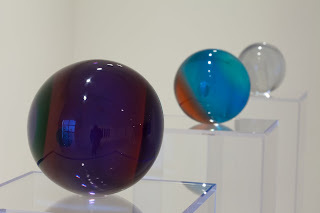 Courtesy David Zwirner, New York. Photo by Philipp Scholz Ritterman. ... they remind me of the monolith at the start of Stanley Kubrick's "2001: A Space Odyssey"—presences that seem to have arrived, unexplained and inexpicable, from outer space. Bruce Nauman, Green Light Corridor, 1970, painted wallboard and fluorescent light fixtures with green lamps, dimensions variable. Collection Solomon R. Guggenheim Museum, New York. Panza Collection, Gift, 1992. Photo by Pablo Mason. (c) 2011 Bruce Nauman / Artists Rights Society (ARS), New York. ....which you can navigate only sideways, at snail’s pace, through eerie green light; when you emerge at the far end, everything is suddenly violet, slowly changing into pink. And you find yourself released into a gallery with a Robert Irwin work, installed long ago, in which the artist simply removed certain geometric sections from the slightly tinted windows, looking out over the deep blue Pacific Ocean, creating in each case a “hole in space” that reminds us how often we fail to see clearly, because we do not pay attention unless invited or compelled to do so. And finally, the wondrous black hole created by the late Eric Orr—a room so dark that it seems, as you feel your way in from the entry, completely devoid of light. Once inside, you stand in total darkness, never imagining it to be penetrable in any way. Stand there for three or four minutes, though, and the eyes, amazingly, adjust. The silhouettes of other visitors start to emerge, black against the barely detectable glow of light, coming from you know not where. A few minutes more, and you begin to be able to see detail, soon quite clearly, as the darkness recedes. It’s an amazing, slightly dizzying experience, and one that works on the mind in somewhat the same way as the anechoic chamber works with sound—or the absence thereof. You watch yourself becoming aware. All in all, "Phenomenal" is an ambitious show, and a welcome resurrection of a piece of the unique history of art in this part of the world—an area so singularly blessed with natural sunlight that it inspires its artists to investigate that property in their work; and seemingly so receptive to creative freedom that they readily dispense with convention and received ideas about what art should or should not be. It becomes whatever the human mind is capable of perceiving and experiencing with delight, whatever expands our vision and potential. Which makes it a special privilege to live and work in Southern California.